Gigboard's 7" full-color touch display and single rotary encoder make it fast and intuitive to start building the guitar rigs of your dreams. Choose from limitless presets for instant inspiration, or effortlessly blend dozens of amps, cabinets, mics, and pedals totaling thousands of custom combinations. Then output to the PA/FRFR of your choosing, or port directly into your DAW over USB. You can even import your own third-party cabinet impulse responses for truly expandable pro-level results. Gigboard's dedicated looper (up to 20 minutes) and tuner switches make it so you never get lost on a dark stage. Underneath, HeadRush's Eleven HD Expanded modeling engine and quad-core DSP brilliantly model the latest in current must-have gear as well as timeless classics. 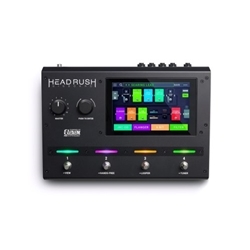 A license for Pro Tools First, preconfigured for your HeadRush Gigboard, is included with purchase. The first time you touch your finger on Gigboard’s 7" full-color touch display, you'll already have a good idea of how simple it is to select models, tweak their tone, change your signal path, and save settings. Select an effect simply by tapping on it, change its value using the familiar rotary encoder, and change the order with a simple swipe.